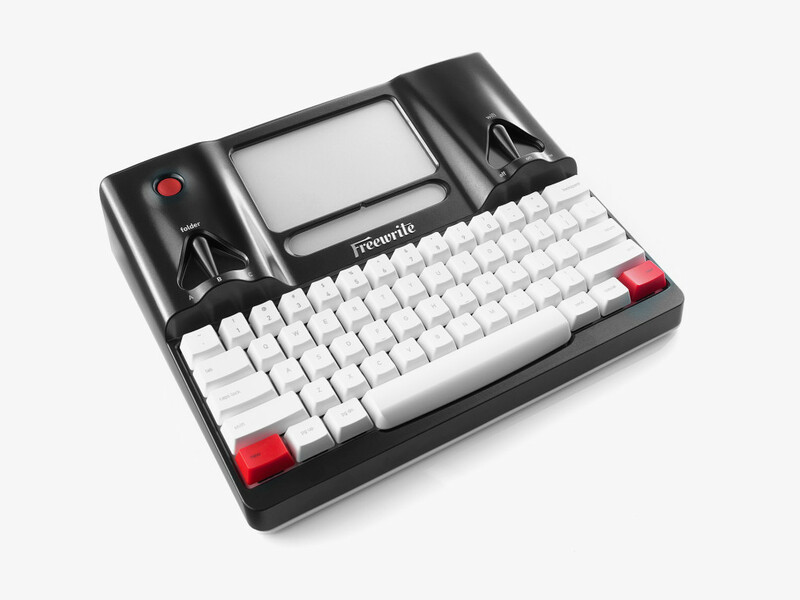 I jumped on the Freewrite/Hemingwrite kickstarter ages ago. It took so long for the single purpose, first-draft-only word processor to show up, I'd occasionally forgotten it was coming. I've had it for a few weeks now, and last weekend I typed a review out, on the unit itself. Thing is, you can't edit on the unit. The review below is the raw output of my clattering away at the old-timey keyboard. If there is elegence to be found in simplicity, the team at Astrohaus have done their damnedest with the Freewrite, their single-purpose, distraction-free word processor. Originally billed as the Hemingwrite, I bought into the kickstarter on this years ago, hoping it'd help me focus on some short stories I never get finished while working on my laptop, or bother to transcribe from my notebooks. I waited a long time for this unit, so I'm a little less forgiving of the problems than I might be with another kickstarted piece of kit. I have absolutely no complaints about the fit and finish. The device is pretty lovely in its gaudiness. 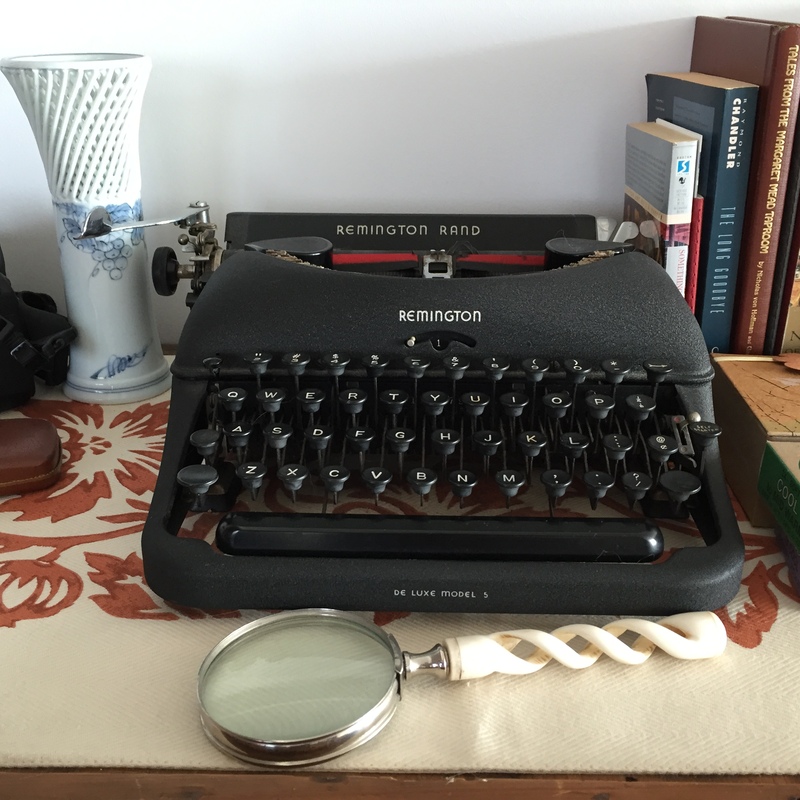 It is supposed to resemble a typewriter, I think of the 1920s-1930s generation of my Remington Rand Deluxe Porta 5. It sort of does, the selector switches are mounted in a way to resemble the reels for ribbon, but it more closely feels like a mid to late 1990s portable wordprocessor. It weighs slightly, but not much less. It works about the same, and part of its charm is that it throws back to a mechanical keyboard like they would have used back then. The keyboard is pretty much heaven, if you come from the days of yore, as I do. It feels like I am jamming along on a Commodore Vic20, or a WYSE terminal. While the e-ink isn't vac green, its about as slow as the old led based screens would have been. You get just enough text on the screen to let you read back 1-3 sentences. You can't edit at all, aside from erasing with backspace, so watching as you type and not looking at your fingers on the keyboard is really critical. I find that if I miss a typo by more than 5 words, I try to leave it and not go back. You can edit in Google Docs, Word or whatever editing/wordprocessing program you like, howev er once you start editing off the freewrite, you can't directly append to the edited file with new text. Freewrite only uploads to the cloud, and creates a new file each time it does. You can choose to have your file emailed to you, or saved to a Google drive, Dropbox or some Freewrite sponsored web application. I used Google Drive, as its what I use, and it was pretty easy to connect. Logging into new wifi networks is a mixed bag. Anything that has just an SSID and password will work, but managed free wifi networks like starbucks, which requires some html logging in, will not authenticate, but the network will appear to be working. Don't get too frustrated when your files aren't uploading, I just trusted it'd work out when I got home, and it did. You may not really want to use the thing in public anyhow. I've taken it out a few times and while the fit and finish are lovely, the bright red and white keyboard certainly stand out. The clack clack clack of the keyboard is really soothing to me as I type but I bet it is driving the people around me nuts. I've also had a bunch of power issues with the unit. The guys at Astrohaus tell me there is a firmware update coming that'll allow me to charge the Freewrite off my laptop's usb ports. Right now if I plug it into a laptop the power button becomes inoperable. I have to plug it into a wallwart charger and hard reset it. I keep checking to see if the firmware has updated, and bricking the unit. This error also led to a terrible first weekend with it. All in all, if I force myself to sit down with it, I do actually write. I’d say it works there are a lot of words above. You are reading them. Yee haw! Is Alphasmart STILL the ultimate writers' tool?